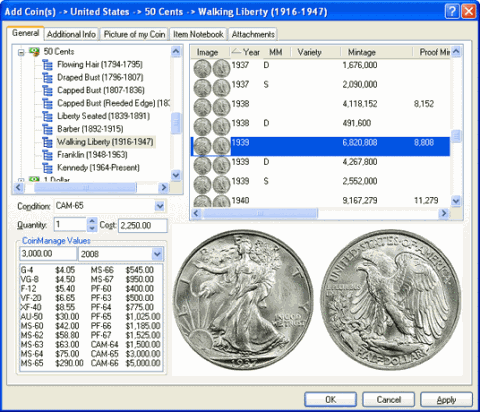 Free Coin Collecting Software is next to impossible to find, and when you do happen across some, chances are that it will not have the functions that you need to accurately catalog and inventory your coin collection. Believe me, I have looked everywhere for free coin collecting software. I guess the old saying, "You get what you pay for" is true for coin software too. The next best thing I can recommend is a coin collecting software that has a free 30 day trial. Coin Manage from Liberty Street Software has a 30 day free trial and the best part is you don't have to give them any personal information to get the free trial. CoinManage is the premium coin collecting software for Windows used by coin collectors the world over. Includes a comprehensive and accurate values database, recently expanded to include many more grades. Values are updated twice a year and are downloaded via the automatic program update feature. Pictures of each type to help you identify the coins you own. Individual pictures for sets and major design changes within a type. Over 1200 images in all. New bar code feature lets you track your certified coins (PCGS, NGC, etc..). Retrieve data related to a certified coin by simply scanning the bar code on the coin slab using your bar code scanner. Attach up to 4 of your images to each coin record. Keep track of defects, Purchase and Selling info, etc. Types and Varieties Manager allows you to add data for Countries or Varieties not present in the program database. Instantly see which coins you need to complete a particular type. Print the list if you like. Here is a screen shot to give you an idea of what Coin Manage looks like. So, while Coin Manage is not free coin collecting software, it is the next best thing when you use the 30 day free trial. Download it and give it a try and if you find that it is not for you, simply uninstall it from your computer and you are done.